We left Platerias into a gentle on-the-nose wind but managed to tack across the 12 miles to Petriti. We anchored without using the engine, a first for us. 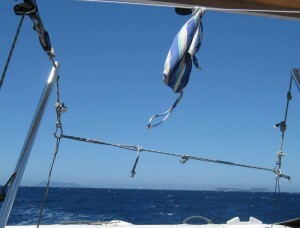 We came in behind a couple of yachts and turned straight into the wind and as soon as we lost way dropped the anchor. 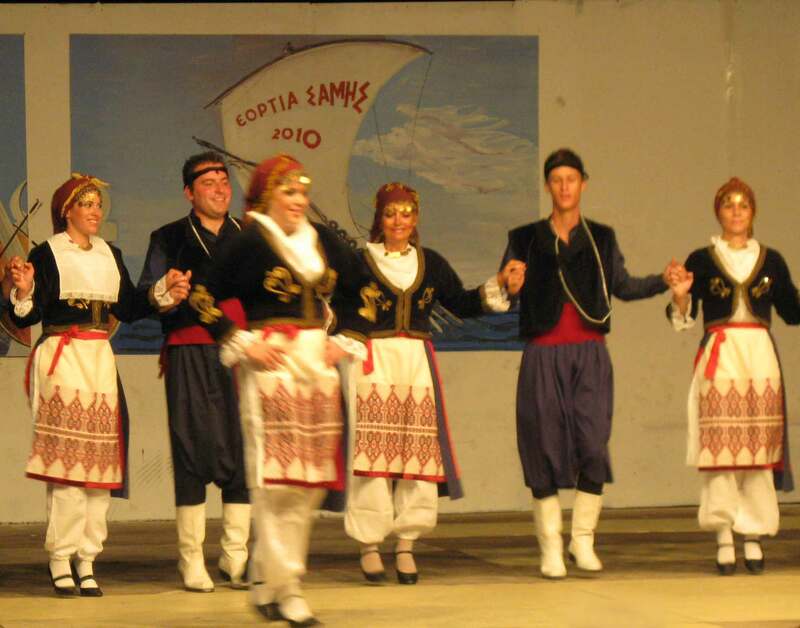 We decided to eat at Stomatis, our favourite taverna, as we knew the daughter, Maria, and her brother would be demonstrating Greek dancing. The place was buzzing as two groups of flotilla sailors, young and noisy, were eating there. The demonstration was magical with the pair perfectly in time and then the father, 78, got the youngsters on the floor and showed them what to do. It was a hillarious night. The lights went out twice and Maria and her husband were obviously having a huge row. He had just arrived from Italy and something had put his nose out of joint so he huffed and puffed as he did some waiting on. 2nd August We swam ashore pushing the tender and showered and washed our hair at the beach shower. We also used the free water to do some washing. 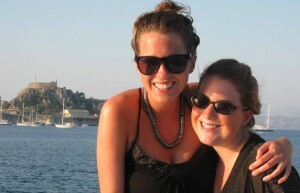 Then we set off north in gentle winds for Corfu town to pick up Carla and her friend, Krista. We anchored in the corner of the bay close to the airport and walked about 15 minutes to meet them. We celebrated Krista’s 2.1 degree result with a bottle of bubbly and explained the delights of the poo loo and the wee loo before settling them in in two cabins. 3rd August The girls joined us in our early morning swim then we set off for Lidl. Our attempts at sailing off anchor were unsuccessful and I had to start the engine. In fact the winds were so light we motored all the way. I stayed on board and did my mechanical checks while the 3 of them went shopping. The engine was too hot to check the oil. We sailed north and decided to anchor in a bay called Ag Agni but it was too crowded. As we left the bay the engine cooling alarm started beeping so we switched off immediately as the temperature gauge was right across. I’d been too busy manoeuvering to notice and was in the process of hoisting sails. The wind died and suddenly we were dangerously close to rocks. I tried calling for assistance on the radio with no response. Sue and the two girls jumped in to swim/push the boat away from the danger. I managed to attract the attention of a passing motor boat but the Italian and his girlfriend were very inexperienced and of little help. Then the wind increased. However the girls were in the water and had not lowered the tender but I managed to get them on board, hoist the genoa and sail off, dismissing the willing but useless Italians. We sailed into a familiar bay, Koulara, and anchored. When the engine had cooled down I checked to see if it started to save myself a sleepless night. 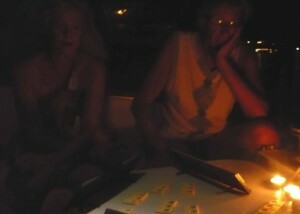 We then played the train game by candlelight. 4th August Sue got up early and spent ages scrubbing the deck. 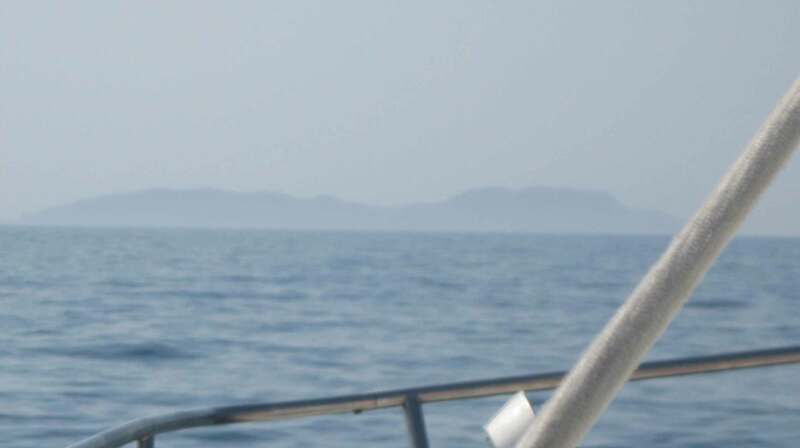 I had just started my sun salutation when a couple of locals started shouting at us telling us to move and threatening to call the harbour police as we were anchored in their swimming area. We set off as soon as had had breakfast but the engine started to overheat again so we sailed into Agios Stefano and dropped anchor. I checked the engine water pump and all the hoses, then found a header tank which was empty. This was not on my list of mechanical checks unfortunately. We topped it up but the engine still was not cured so I stripped the electric pump and this too was fine. The only explanation was an air lock in the system. We eventually managed to get rid of this and run the engine with the problem cured. I was too tired to move on so we decided to stay put. Strolling past ‘the best restaurant in Corfu” we were charmed into visiting it again. 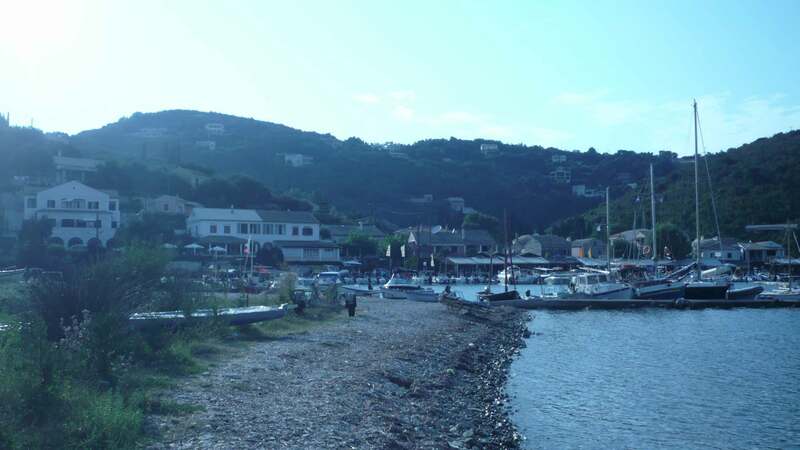 5th August Set off from Stefanos with the gennaker but the wind soon swung and we tacked all day towards our destination, Erikousa, a small island north of Corfu. Neither girl travels well and both became queasy in the large swells as soon as we were out of the shadow of Corfu but niether succumbed. The wind died when we were 6 miles away so we had to motor, giving the cooling system of the engine a good test, which it came through with flying colours. The place is absolutely beautiful, much less commercialised than anywhere we’ve been before and the colours at sunset were georgeous. 6th August Woke up to an amazing transparent sea and went for a before breakfast swim and walk along the long sandy beach. Meanwhile the girls prepared our breakfast. Spent the day in the village, walking around, drinking coffee in a shady bar and lazing about on the boat whilst the girls sunbathed. In the afternoon the girls took the tender ashore and had a shower on the beach. A strong west wind got up in the night and we had a rough night. 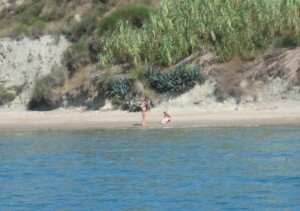 I rowed ashore to get bread and the girls swam ashore to buy more sun tan cream. 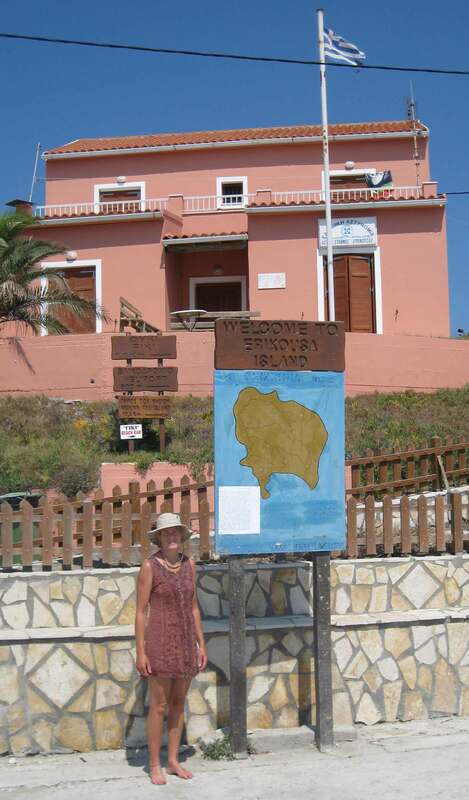 Then we set off for Othoni, the furthest island from Corfu. It took us the rest of the day to get there, including an hours motor session. The harbour was quite busy but we found a reasonable spot. Then the wind got up. In the middle of a game of cards suddenly the anchor lost its grip and we were going backwards at a frightening speed. It was almost pitch black too. We managed to start the engine and re-anchor successfully but hardly slept all night, just listened to the wind screaming through the rigging and the anchor bridle rope creaking in the cleat. T he anchor alarm which works from the satellite navigation system, gave me some peace of mind. I set it so it would go off veryuickly if the anchor dragged. 8th August After a brief swim to try to relax, we set off into a wind of about 20 knots with a long sail back in front of us. We wondered why we’d gone to Othoni at all. 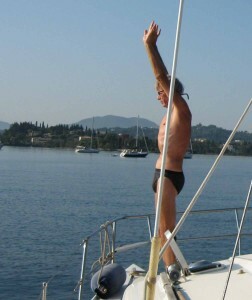 We had a brilliant sail to the top of Corfu, reaching speeds of 10 knots, when the wind dropped. We hoisted the gennaker and set off at a good speed. Unfortunately the anenometer doesn’t give usuable readings with this sail hoisted and the wind increased again without me recognising the danger signs. 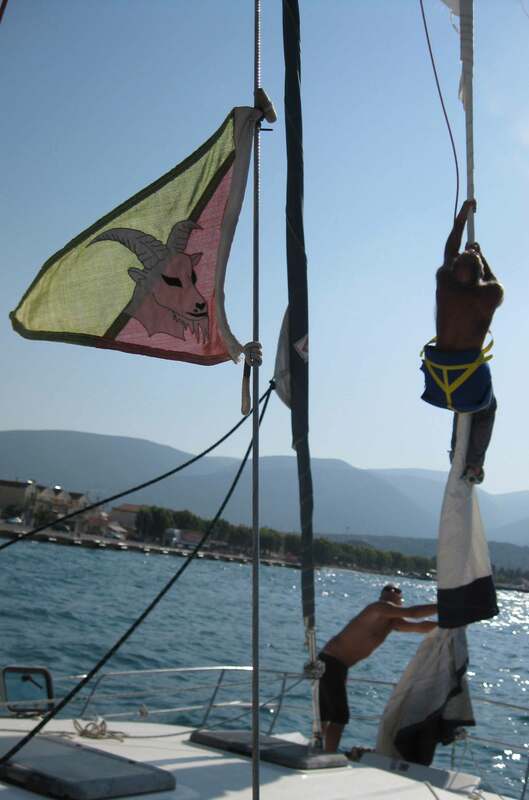 Just as we were passing a dangerous reef by Agios Stefanos there was a loud bang followed by a ripping sound and the beautiful sail had split from top to bottom. Almost at that moment the wind dropped (why hadn’t the sail lasted a minute longer?) and after retrieving the damaged sail and floundering about for a bit with the other sails hoisted we dropped them all and had a swim. Sue and I were both very upset. We made it to Gouvia bay, after sailing for almost 30 miles and took the sail out of the snuffer. The girls cooked us sausage and pasta. 9th August To Lidl to get as many supplies as we could carry. 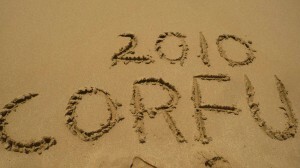 Then to Corfu town. The girls cleaned while we were shopping and washed their sheets on the back of the boat by hand. We anchored as close to the airport as we could so it’s only a short walk to the airport. We had a final meal ashore with the girls and walked them to the airport. A peaceful breakfast with the prospect of a few days on our own. Set off quite early and soon were sailing south. The wind lasted most of the day, although we did two hour-long stints with the motor when the wind dipped as we needed to do the distance. 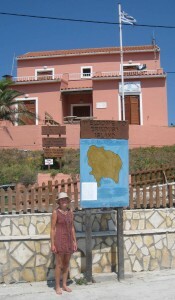 We were in two minds whether to stop at two rock bay at about 5 or to try for Preveza, a further 15 miles further south. 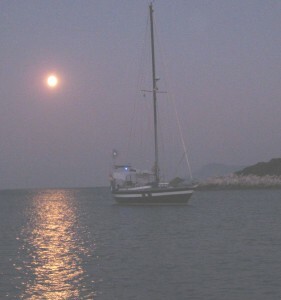 The wind seemed favourable so we chose the latter, arriving at the buoyed channel in at 9 pm, 20 minutes after sunset. By the time we reached the end of the channel it was pitch black and we still had a couple of miles to negotiate. We’d been unable to locate a searchlight and our torches were useless and there were flashing red and green lights in all directions. We almost ran aground but finally found a mooring spot at 10 pm absolutely shattered. Woke up exhausted after yesterday’s marathon sail amazed at how friendly the harbour looked after last night’s difficult sail in in the dark. Disappointed not to be able to explore the town or the inland waterway behind it we set off back down the buoyed channel and sailed down to Lefkas. The wind was very obliging and got us there just before 12 when the bridge to the canal opens and lets everyone through. 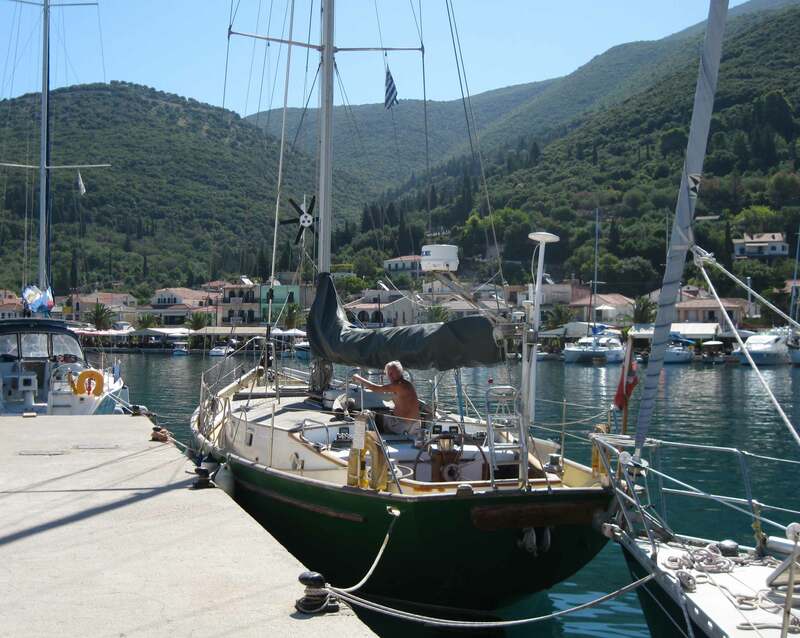 Again disappointed not to have time to explore we fueled up and carried on through the canal under motor and then sailed to Vliho where we’d heard there was a possibility of sorting out the damaged sail. It was so hot the water was tepid. We both washed our hair, diving into the sea to wet it, shampooing it and then massaging the soap out of each other’s scalps in the sea as the recipient of the treatment lay on their backs. We went ashore found second hand Geoff (no connection to Porthmadog Geoff) who couldn’t help and a couple of other contacts who may be able to. 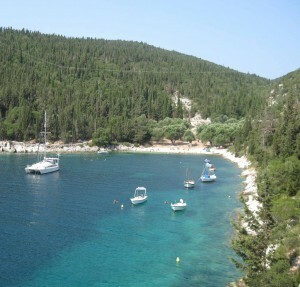 and had drinks and a meal at the Vliho Yacht club – full of English people, which made a pleasant change. Back to the yacht club to make use of their washing machine and wi-fi. Very friendly and helpful. The local seamstress just nearby doesn’t want to repair the sail but Mark could bring a replacement from the UK in 4 weeks time and we’ll just have to manage without it. 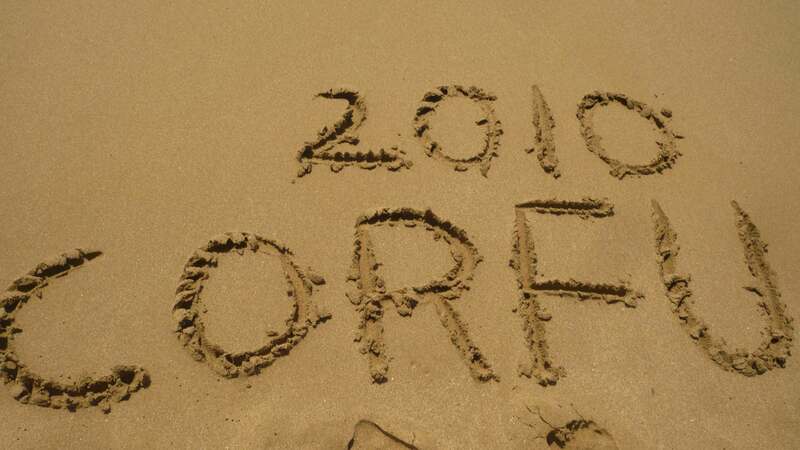 Just over two thirds of the way through our Adventure and wonder how we’ll adapt toour life back in Criccieth. The way of life here is wonderful in many ways and because we’re mostly very busy quite simple. The stresses are things like are there any rocks ahead, where shall we drop anchor, where shall we head for – quite demanding at the time which is good. Will we want to do something similar in the future is questionable. Sailing is very addictive, very pleasurable when things are going well with rewards when your plans come to fruition but one misses the life we’ve grown used to at home and some of the home comforts – washing machines, showers, space. So the experience will undoubtedly have changed us but we don’t know how yet. Set off after lunch towards Ithica into a strong headwind blowing down the Meganissi channel. As we emerged we were able to switch off the engine and hoisted all three sails. The wind increased so we reefed the genoa by a third and then down to half. The wind speed was about 22 knots so I was being cautious after the burst gennaker. Not cautious enough for the old sail which startled us by flapping. Upon investigation we saw it had split so we reefed it in quickly. I didn’t seem able to steer the boat with just the stay and main sails so started the engine. The wind increased further to 26 knots and we were battling against it. The oil warning light on the engine started flashing so I switched it off and hoisted the main sail to steady the boat while I topped the oil up – level was OK at my last check? Then decided to try to get shelter behind Arkoudhi, a small island, and battled into the wind and sea making very slow progress. 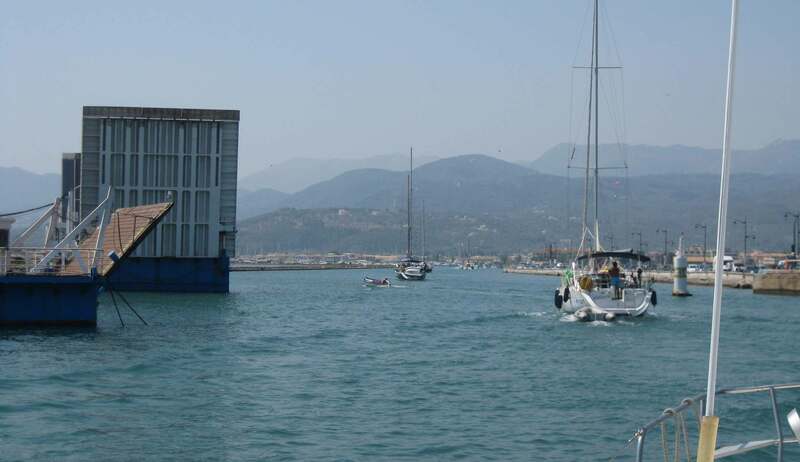 The autopilot could cope as the speed through the water wasn’t much greater than 1 knot. Then the steering started leaking hydraulic oil from below the wheel and we were becoming seriously concerned. We topped it up and the steering became more responsive and also I switched to using the tiller (connected to the propeller) which works well at low speeds. The island protected us from the waves but there was nowhere to anchor so we decided, as the wind had abated slightly, to motor on. We arrived at Ithaca and tried to anchor in a bay recognised in the book but it was too deep so we motored to Frikes harbour. Lots of the yachts were side on to the quays and our only option was against a floating pontoon. Sue rustled up a meal from nowhere. After a while the anchor slipped as there was a strong wind blowing us onto the quay so we threw one rope ashore and slipped the other two, lifted the anchor, dropped it again. There was no one on the quay to help us with the ropes this time and Sue jumped off. We lost position and I had to leave her there and try to manoeuvre the boat in a strong wind on my own. This took ages as by now I was exhausted. We managed to secure the boat again and the anchor appeared to be holding but I took a line ashore from the bow across to the quay as extra security. Then we sent a text to Mark and Francesca letting them know of our predicament. Had very little sleep as we listened to the wind whistling, trying to push us onto the quay, with little faith in the holding power of the anchor. Got up early, wrote the blog, entered the waypoints for the day’s sailing, did my sun salutations, washed up and made breakfast. Before we cast off I noticed the rope pulley that lifts the leg was not attached. While I was fixing that another boat was struggling to release their anchor and we were concerned that they might dislodge ours. 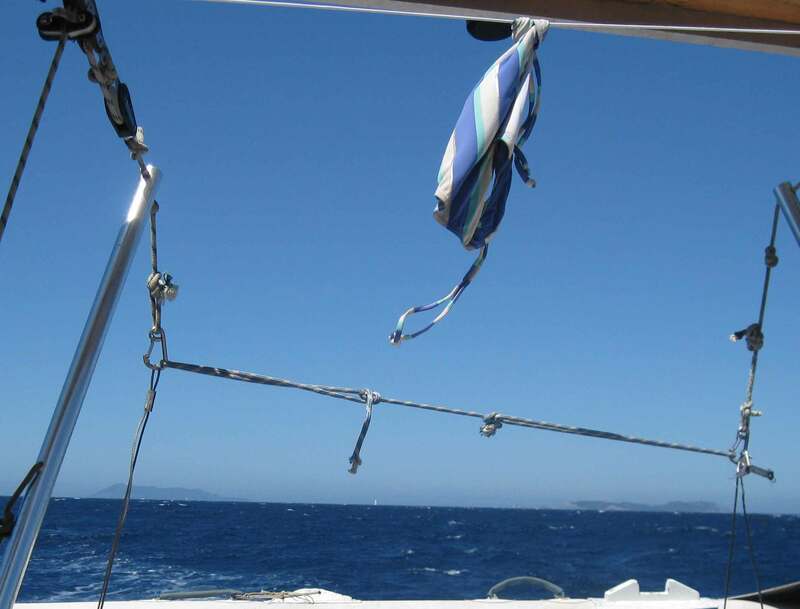 We cast off the forward rope and stowed the dinghy only to find the anchor caught on a rope. We tried going forwards, sidewards, backwards etc. 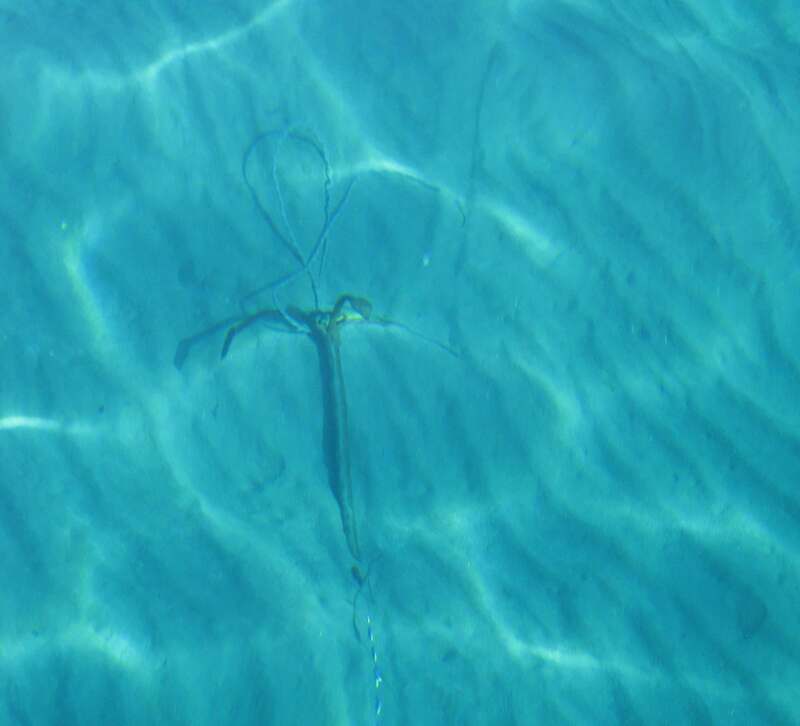 to free it but when I got out my mask and snorkel I saw we were hooked on a chain attached to a huge concrete block so we lowered the dinghy and dropped a second anchor so we could slacken off the main one. 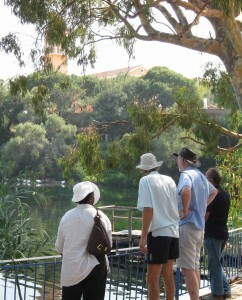 Magically at that moment a very kind Italian man came by in his tender, dived down the 7.5 metres and released it. Sue then drove the boat (a rare occasion) whilst I pulled up the secondary anchor. She shouted that an engine alarm was showing but we were too vulnerable in the harbour in the strong wind and had to ignore it. As soon as we were out of harbour and being blown up the bay I sorted the problem – the bracket tightening the fan belt had come loose and fallen into the bilges. These were very oily and I got covered so before we started the engine I leaped into the sea and had a good wash.
We were shell shocked by then, wondering what else could possibly go wrong. 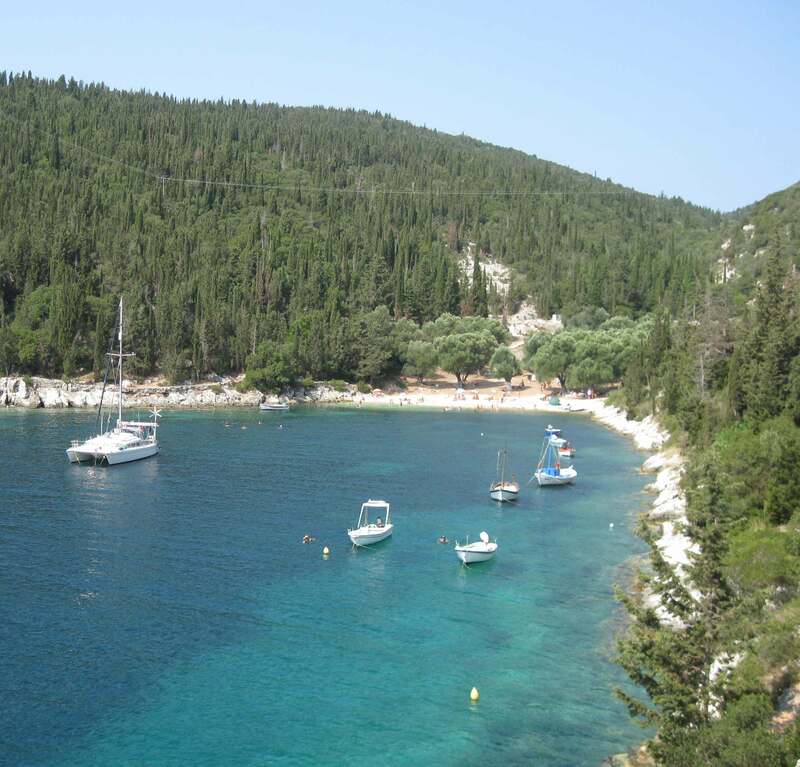 We changed our planned destination of Argostoli to Sami, which was much closer and reachable in a day. We arrived there before 5 and moored up. Another very kind Italian and his three lads from a boat on the other side of the quay offered to get the damaged genoa off the forestay. So we hoisted him in the boson’s chair while he tried to unfurl the top of the two separate bits of the sail. It was very choppy and he was swinging about all over the place. Mark and Francesca texted to say they had arranged to get us a replacement sail but suggested we try to repair the damaged one ourselves. We had a restful evening and retired early very grateful to the very kind people who had been so helpful in our difficult circumstances. Had a good night’s sleep and woke in more optimistic mood. Our new friend Ted, a retired coal miner who’s sailing round theworld and offers free passage to anyone who wants to join him, suggested we move into the harbour, which we did. Started sewing the sail but very slow progress. Went for a swim on the town beach and then invited for lunch with Ted. 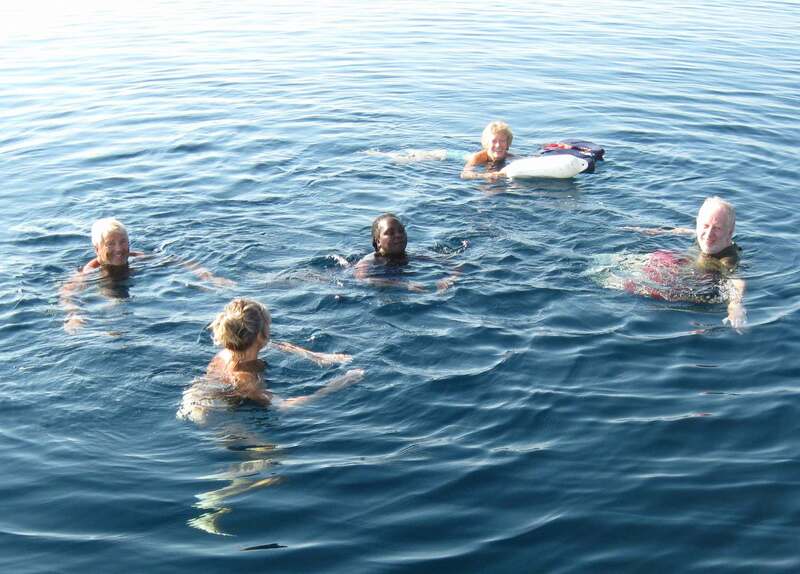 Jo and Chris arrived on the bus from Argostoli and we all went for a swim. 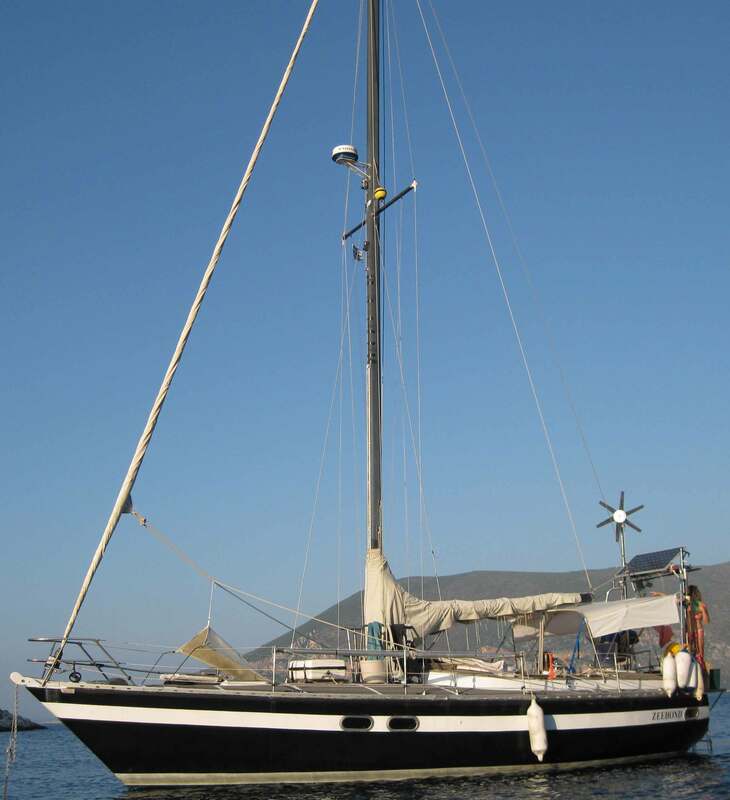 A very kind Frenchman, Andre, took pity on us and offered the use of his sewing machine to repair the genoa so we then tacked the split seam instead of sewing it which took about a twentieth of the time and made repairing it a real possibility. We cooked a meal and took it across to Ted’s yacht and ate there with him. Our cockpit was full of the genoa. Went for before breakfast swim from the town beach and shampoo and showergel on the shower there. Had breakfast all together then Jo and Chris went to the beach and Sue carried on sewing! The two ends of the tear were more problematic as they had to be patched and tacking was out of the question. 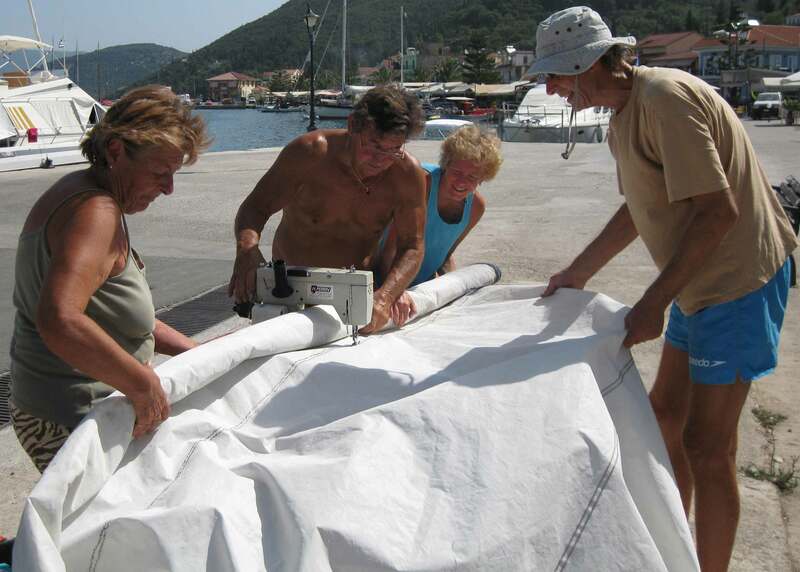 We managed to get the sail ready for the agreed time of sewing, 9 am next morning. We also plucked up the courage to go and register with the port police, which had concerned us as the boat’s document had not been stamped since 2009. 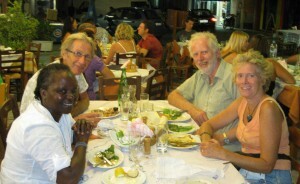 In the evening we went to a taverna where they were playing traditional Greek music and had a lovely meal. Up early to connect up the hose and wash the salt off the genoa so as not to get it on the sewing machine. Then Sue and I found a large flat area to lay it out to dry. Andre arrived and borrowed a table and chair from a pavement cafe and for the next three and a half hours he and his lady friend Marie, Sue and I manoeuvered the huge piece of fabric through the hand operated zig-zag machine. We didn’t just repair the tear as on inspection other parts of the sail were very fragile and could have gone at any minute. In the afternoon the wind got up so no opportunity to hoist the sail into position. Jo cooked us a meal and we played blob. Woke early but windy so had a lie in. Strong winds forecast. Confined to port. So swimming off the beach. 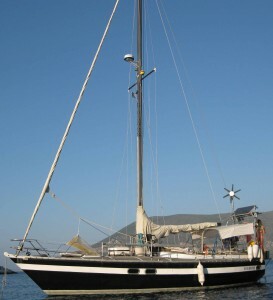 The wind died at about 22.30 so Sue and I hauled the repaired genoa. The idea of using washing up liquid as a lubricant seemed to do the trick. Did some engine checks and topped up the oil – had to buy a new can – concerned about this. Did some shopping and said goodbye to our new friends. Waited about an hour in the port police office to pay for the extra day only to be told not necessary. Set off about noon and hoisted sails as soon as possible. Had a frustrating sail as wind kept increasing to 17/18 knots, at which point we’d furl the genoa as we’d been advised it wouldn’t cope with winds stronger than this, then the speed of the boat made it difficult to tack on just the main and stay sails. Eventually made Andresami Bay, where we anchored off a small beach which we had to ourselves later. As it was a little exposed and we’d had some strong winds recently we dropped a second anchor and took a line to the shore. Jo and Kris got a bit queasy on the way over but were delighted to be somewhere new and loved the clear water and diving off the boat. Very difficult for us as we’ve lost faith in the boat with all the problems we’ve had and we’re just praying there won’t be another major disaster. Text message from Dave and Viola to say they’ve the spare sail and could we meet tomorrow. Woke up to a glorious morning – the only boat in the bay. Retrieved the second anchor and the shore line with the use of the dinghy. 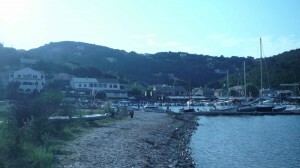 Set off to motor to Fiscardo and travelled to a bay just south into a brisk headwind without mishap. D and V waved as we entered the bay and we stopped to chat and pick up the sail. Just then the charge warning light came on and I had to find a spot to anchor quickly. Sue had invited D and V for lunch so I quickly got up the engine boards to fix the alternator bracket again, this time using spring washers – but unfortunately I could only find one so I tightened the nut and bolt as tight as I dared. We got on really well with D and V and Sue prepared a lovely lunch. After clearing up and dropping a second anchor we swam ashore and then went back for capuccinos on D and V’s boat, a 1980 steel boat in amazing condition. 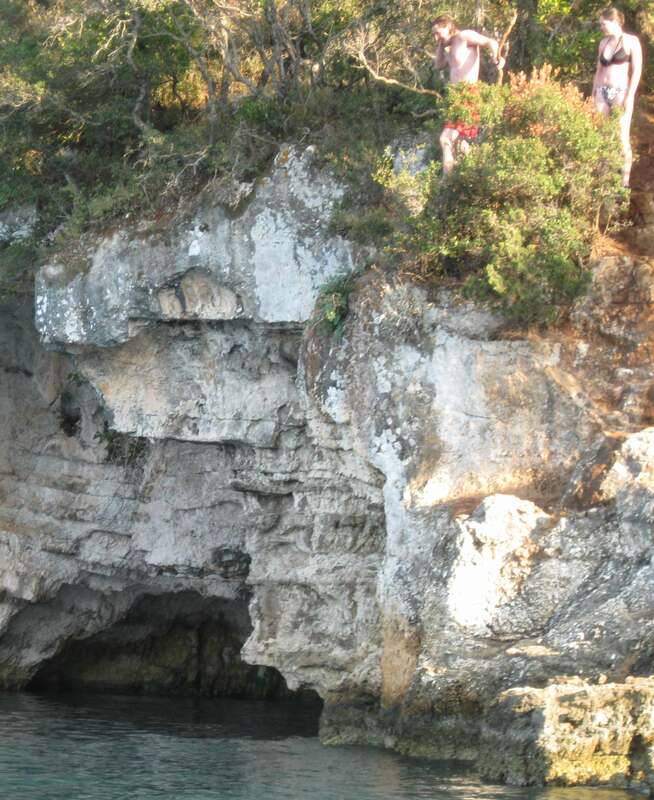 Jo and Kris were jumping and diving off some high rocks over a cave and we went over in the tender to take pictures. Beer and crisps on the front deck as the sun set then a meal and a game of blob. A much better day. Swam to the beach before breakfast. The fresh water pump wouldn’t switch on without a knock so I found the filter clogged and cleaned it. Couldn’t get the pump to switchas bad connection to filter. Put me in a bad mood. Sue, Jo and I walked into Fiskardo and briefly met D and V were servicing sailing holiday boats. I walked back, took up the second anchor and we motored back to Sami – wind on our noses in both directions, yesterday from north, today from south. Seems like the gods aren’t smiling on us at the moment. We went for a swim, then Jo and Kris took us out for a meal. 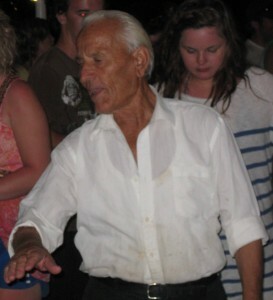 There was a major function and we were able to sit down and watch an hour’s Greek dancing. Lovely with the ferry on one side and the yacht masts on the other. Got up before the others and tried for 40 minutes to fix the water problem unsuccessfully. Then checked the oil – empty again. I was in dispair. Went for a swim and came back. Managed to locate a mechanic as I had decided the boat was not seaworthy until the oil leak was fixed. 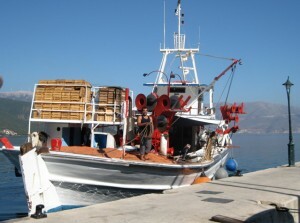 Felt relieved that I’ve decided to do thid rather than worry continuously whether the engine is going to pack up on us. A man called Denis called at 12.00 to take Jo and Kris to the airport. 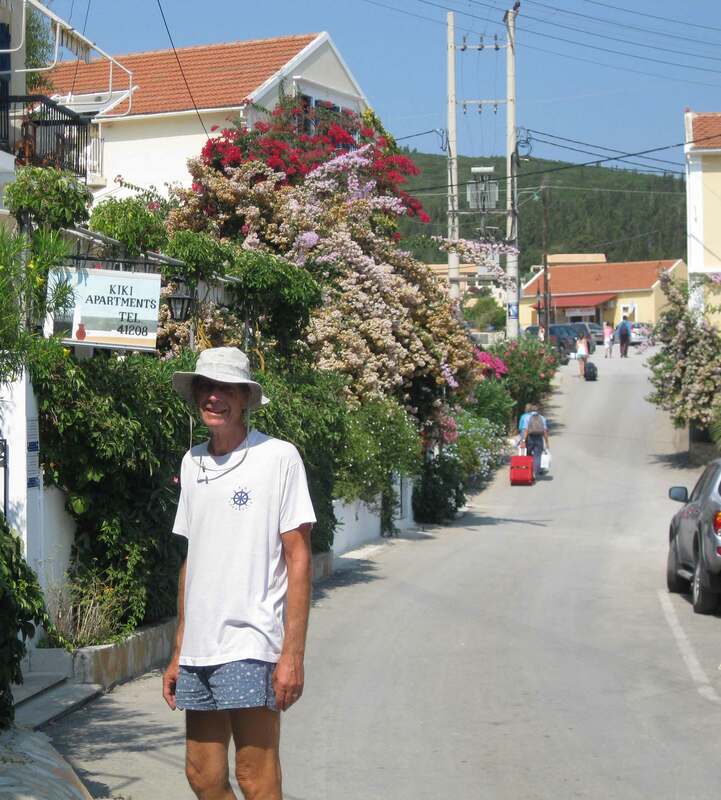 We went with them and after our goodbyes went on to meet David and Anna at their hotel in the square of Argostoli. Denis then took us to a pleasant bar for drinks and to a ground water lake before returning to the boat. After a cup of tea we took David to the beach while Anna rested, then beer and crisps on the front deck. Just before supper Andreas, the mechanic, rocked up and inspected the engine, pronouncing the head gasket gone. No spare but Mark texted that we should tighten the rocker cover nuts. Found (hopefully) the problem with the water system is the filter not properly seated. Sue took the laundry and then went shopping with Anna. Having tightened rather loose rocker cover nuts and as we have no spare gaskets I decided to set off. Anchored in Polis on Ithica but the wind kept shifting around we ended up closer to another boat than was acceptable so we put out a stern anchor and a rope to the shore to hold us away. Anna bravely decided to try swimming with a life jacket and did very well. We had a swim to look at the cave but it was closed off. Then we took up all our various fixings and sailed to our meeting point on Arcudi with D and V. It was absolutely beautiful there and we went swimming. 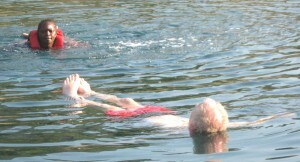 We shared an evening meal with D and V.
We swam over and joined them for a while. 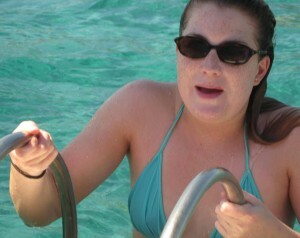 Then they persuaded Anna to try swimming and to swap the life jacket for a fender, then to abandon that as well. Very brave of Anna and very good teaching. We shared a meal with D and V again aboard Nine Lives. A peaceful night and a lovely calm morning. We went over to Zeehond for coffee and Anna was persuaded to swim back to Nine Lives. Sue and I did some snorkeling. 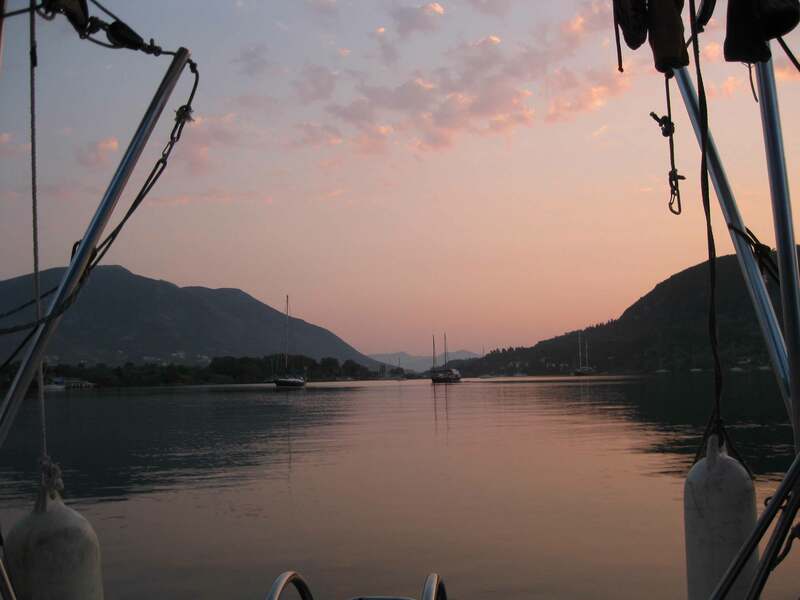 After some discussion we reluctantly set off for Vathi, the capital of Ithica, We had had a wonderful time. We had a good sail until we came within 4 miles when we were in the lee of the mountains so we were forced to motor. David and Anna thought they would like to catch the ferry to Sami and spend another night in Argostoli only the ferry is at 6 am. They took us out for a ‘last meal’ anyway. We got up late and I did the engine checks – oil everywhere but the engine! Sue and I went to shop and met up with David and Anna at lunchtime. They decided to stay and have lunch in Vathi and we had ours on board. It was very hot and Bill kept having to cool off in the sea. We went ashore when it was a bit cooler to visit an art gallery and we met the artist –not really our taste but it was interesting. 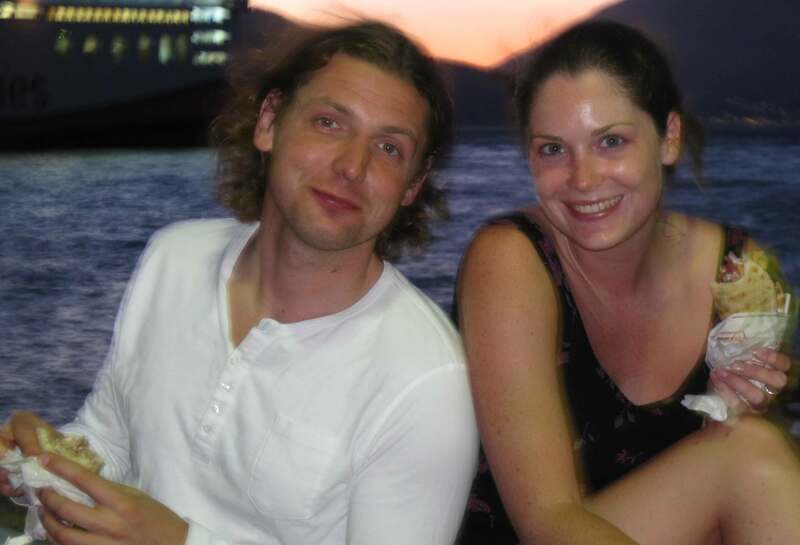 David and Anna decided to catch a ferry to Sami next morning and went ashore to buy tickets. Sue cooked us all spaghetti and we played blob. The wind got up in the night and Anna didn’t really like it. David and Anna got up at about 5.30 to catch the ferry. 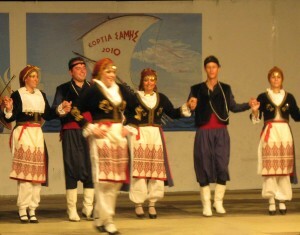 Anna had decided she wanted to spend her last night in Argostoli. The arrangement was they would take the ferry ashore and I would swim over later to collect it. I put a second lot of oil in the engine and we set off for Sami. We motored for a while and the wind kept being on our nose. After an hour we decided to tack and we had a frustrating few hours. We reached the end of Ithica at about 17.30 and the wind dropped so we were forced to motor again. But we had a good sail in to Sami after we left Ithica and arrived just after sunset. We moored up easily and everything was familiar. Ted was still there – his crew hadn’t turned up. Another day with just Sue and I – lovely. We didn’t do much – swam twice, changed the sheets and aired the mattresses, shopped, updated the blog. It was very hot. Eagerly awaited the arrival of James and Rachel – always slightly nervous about how each set of guests will take to the boat and sailing . James and Rachel arrived safely and we showed them over the boat. Sue cooked us a lovely meal. The weather forecast is for strong winds putting paid to my plans for an early departure from Sami. Found a pleasant shady cove in the afternoon. Went out for a very tasty meal in the evening. Filled up with water and filled the engine with oil. Strong winds forecast so staying another day. A quiet night so we all had a good night’s sleep. Strong winds forecast for the night so staying in Sami but intend to sail to the mainland tomorrow before the calm period forecast to follow. A large boat AMZ has been upsetting many of us moored on the town quay because they have had their generator running for hour after hour polluting the atmosphere with diesel fumes and noise. Last night we heard a group shouting at the persons on board and eventually they switched the generator off. We had a similar problem today but they were refusing to turn off the noise. After a lot of shouting (from them not the deputation on the quay who were putting their complaints reasonably) we were invited aboard to the bridge to see why they needed to have the generator running – to keep their navigational instruments running. They have a mechanical problem. We slowly drifted away in disgust as the two ladies shouted at us none the wiser why we were having to suffer but knowing that we weren’t getting anywhere. The wind became very strong in the night and I got up twice to check that everything was OK.